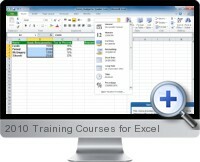 The Excel 2010 training courses provide and interactive environment to learn and master the use and features of Excel 2010. The training courses are divided into 3 levels for introduction to the Excel 2010 application environment, intermediate user lessons and advanced features for data and business analysis. The training courses are designed to be undertaken in a logical order to master all features of Excel 2010 and become proficient in using Excel for analysis and reporting.